Here's a tale of two cities. She's a Philadelphia-born rocker known for driving beats and in-your-face lyrics. He's a Parisian design student with a guitar hero alter-ego and a handful of pixel bricks. What bad grrrl guitarist Joan Jett and apprentice typographer Izzy-sparks have in common is a heart made for rock and an homage font as black and distressed as the lead singer's wardrobe. Jett (free) is a display font with attitude to spare. Jett’s B and V rotate and combine to create a black heart, but that’s not the only trick this font can do. Jett was created as part of a class assignment to capture the essence of a favorite artist using Rob Meek's online application FontStruct. The work began as a clone of another FontStruction. Designers in the FontStruct community encourage cloning (copying a font set) by choosing a Creative Commons Attribution ShareAlike license. This was the case with Formal Roman, a FontStruction inspired by, (but not a direct copy of) Minion Pro, an Adobe font designed by Robert Slimbach in 1990. Izzy-sparks cloned Formal Roman using a simple one-click process to copy individual characters onto a FontStructor grid. Bezier curves are not available in the application. Instead designers build and manipulate "bricks" made from clusters of pixels. The effect is anything but square. The blurred quality of Jett is made from several overlapping combinations of bricks, but it is a tenuous quality. Above 200 points, this smudged illusion opens up to a high-contrast, disintegrating form that is visually engaging in its own right, but visually different. As with Tangle, an experimental display font by Claire Mitchell, the added decoration in Jett is figured into the point size. The characters appear much smaller than unadorned fonts set at the same size. For instance, a 100-point character in Jett matches a 33-point character set in Minion Pro. Be aware of visual height differences when pairing this style. Jett plays well small, making it a swell choice for Web designers working on small format ads and distressed site themes. Unfortunately, the text range is limited. Fifty-three uppercase characters comprise the set. Lowercase, numerals, and punctuation are absent, but the designer has provided less distressed versions of each cap, useful for lowering the volume on letter combinations of more than five characters. 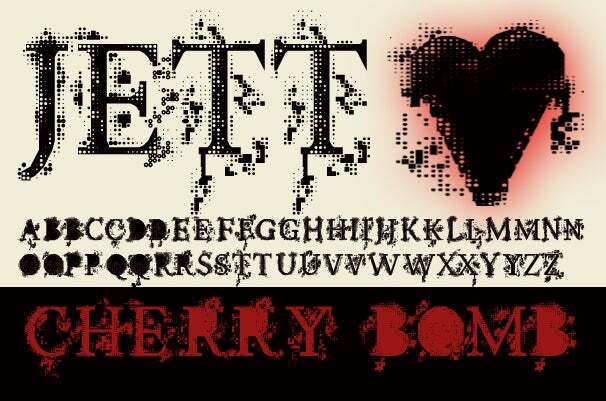 Jett’s B and V rotate and combine to create a black heart, but that’s not the only trick this font can do. The license for Jett allows for commercial work as long as attribution is provided. Want to use Jett to create a new font? Play fair and follow the ShareAlike license restriction, thus keeping the commons creative. It's hard not to like this outsider with an attitude. Jett is a solid tribute to a musician who continues to play past the critics, even as Izzy-sparks's characters, blurred and distressed as they are, stand ready to strike the perfect chord for clubwise designers.